When you book on GigSalad, confirming an agreement and paying vendors is easy. We collect the vendor's total booking price in one payment, and if the vendor requests a deposit out of that total, we'll send it to them before the event. The balance payment is held by GigSalad and sent one business day after your event. If you need to cancel a booking, your refund will be determined by the cancellation policy included in the booking agreement for your event. Each vendor sets their own cancellation policy per booking. They will select their preferences for both the deposit and the balance payment. In this example, both the deposit and balance payments are refundable depending on when you cancel the event. If you canceled this event 15 days before the event, you'd receive a full refund of both the deposit and the balance. If you canceled 10 days before the event, you would only receive a refund of the balance payment. If you canceled 1 day before the event, no refund would be issued. All refundable payments will have a specific cancellation window like in the scenario above. Some vendors may opt for an always-refundable deposit or balance payment, which means you can cancel at any time and receive a refund for that particular payment. Vendors may also choose non-refundable payments, in which case regardless of when you canceled, no refund would be given. In order to receive a refund, you must cancel your event through GigSalad. When you cancel, you'll be given a summary of the cancellation policy and the payments you will be refunded. Once we've confirmed your cancellation, we will issue the refund to the credit card that was used for payment. This process could take 1-2 business days. Once the refund is issued, it may take up to 3-5 business days to post to your account. If the cancellation policy states that no refund is owed, GigSalad will not be able to return any payments to you directly. However, you are welcome to discuss the issue with the vendor to see if they'd be willing to work with you to reschedule their services or give you a partial refund. If they agree to a partial refund, that should be arranged directly between you and the vendor. When you get a new quote, there will be a link included that says "View cancellation policy." This will open a dialogue box that explains the refund policy for both the deposit payment and balance payment. When you click Book Now to proceed to the checkout page, you can review the terms again in the event summary above the price breakdown if needed. 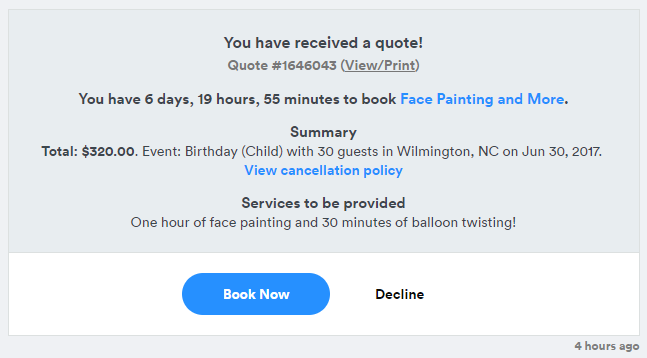 Once you've booked the event, you can always reference the cancellation policy in your agreement, which you can get to by clicking "View/Print." The cancellation policies mentioned above will only be applicable if you cancel your event. If the vendor cancels the agreement, you are covered by our Worry-Free Guarantee. You will receive a full refund of your payment, and we'll also do everything we can to help you find a replacement for your event.